How And When To Harvest Marijuana Plants | The Complete Guide – Cannabistical: of or concerning cannabis. As the legalization of marijuana spreads across the United States, many people are beginning to grow a few plants of their own. That, of course, raises a whole host of questions about how, when, where, and why. One of the most common questions is when to harvest marijuana. 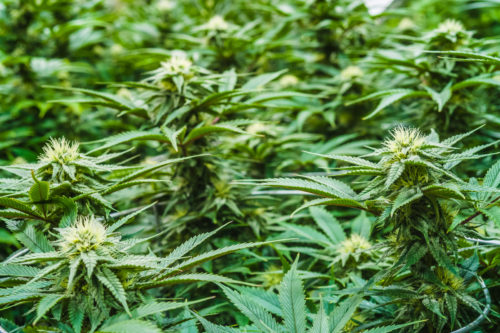 In this article, the cannabis experts at Honest Marijuana will show you everything you need to know about the end of your pot plant’s life cycle and what you should do to get the best buds from all your hard work. Why Grow Your Own Weed? One of the many wonderful things about marijuana is that you can grow it, harvest it, and cure it all on your own. You can literally cut out the middleman and go from seed to sinsemilla in as little as three months. But growing a marijuana plant from seed is actually the easy part. The difficult part is, to paraphrase Kenny Rogers in The Gambler, knowing when to hold ‘em (let the plant mature more) and when to fold ‘em (harvest that sucker). So that’s what we’re going to talk about today — when to harvest marijuana, not playing poker. Before we get to the whens, the hows, and the whys of harvesting, let’s take a slight detour into marijuana plant anatomy so we know what all the fuss is about. We know from elementary school biology that all plants start with a seed. The seed produces roots on the bottom and a stem on the top. The stem pokes its way through the soil and begins to grow tall and strong. From there, the plant produces leaves, branches, and eventually flowers. It’s these flowers we’re most concerned about. But before we focus on the good stuff, let’s briefly examine the other pieces of the plant. The stalk is of no use to us because it doesn’t contain any THC. Cut it and forget about it. The fan leaves (the iconic, universal symbol for marijuana) do contain a bit of THC, but not really enough to make using them worthwhile. Most of the time, you’ll toss the fan leaves after you trim them. The stem of the fan leaf does contain a bit more THC than the leaf itself. For that reason, you can use the stems, in large enough quantity, as an additive for tinctures, extracts and concentrates. And now to the pièce de résistance: the cannabis calyx (a.k.a. the flower, bud, or about a hundred other names). This is what we came here for. This is what we hope to harvest a lot of at the end of our ganja-growing adventure. 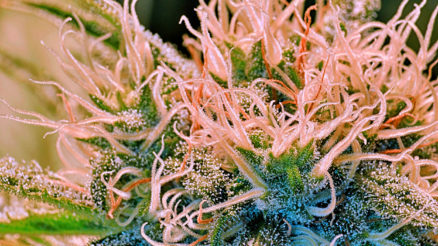 The trichomes are where all the action is (they contain the highest concentration of THC). We’ll focus on them later on when we talk directly about when to harvest marijuana. Just to be clear, sugar leaves don’t look anything like the fan leaves we mentioned earlier (that’s why they have different names). But unlike fan leaves, sugar leaves have a high concentration of THC, so you can use them to make edibles after you’ve trimmed, dried, and cured them. The pistils are the red or orange-colored hairs that protrude from the body of the flower. They don’t have any THC but, as you’ll see in the When To Harvest Marijuana section below, you’ll use them as an indicator of when it’s time to start cutting and drying. 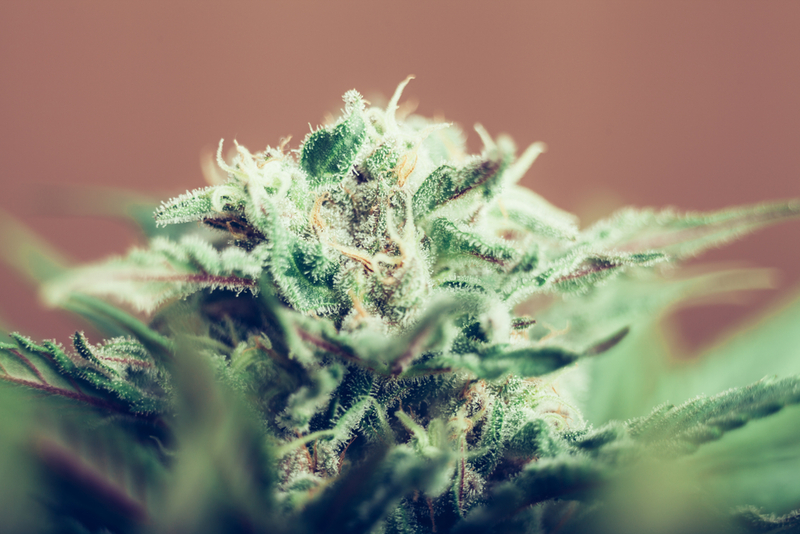 Okay, so now that you know the parts of the marijuana plant, let’s take one more step toward learning when to harvest marijuana by talking about the tools you’ll need to do the job right. All right, now on to the big show. 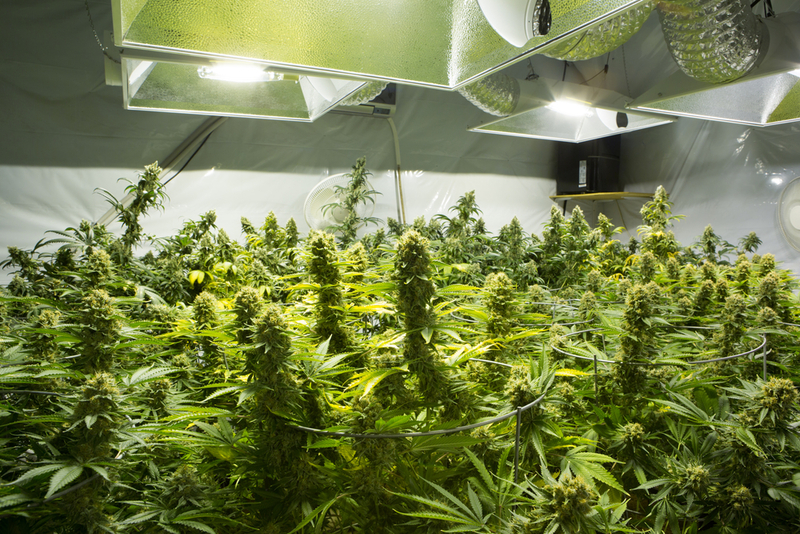 There are three basic methods for determining when to harvest marijuana. In a healthy pot plant that is approaching maturity, the pistils will be white and stick straight out from the body of the marijuana flower. When the marijuana is ready for harvesting, at least half of the pistils will turn dark and curl back in toward the flower. This is where the jeweler’s loupe, magnifying glass, or digital microscope comes in handy. 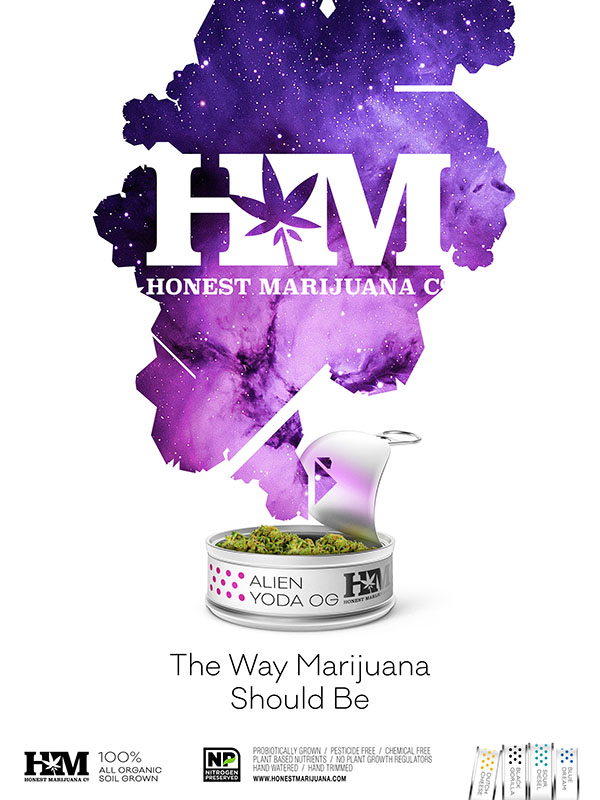 Point your magnifying tool of choice at the trichomes that cover your marijuana flower. If the trichomes look clear and glassy, let the plant grow a bit more. 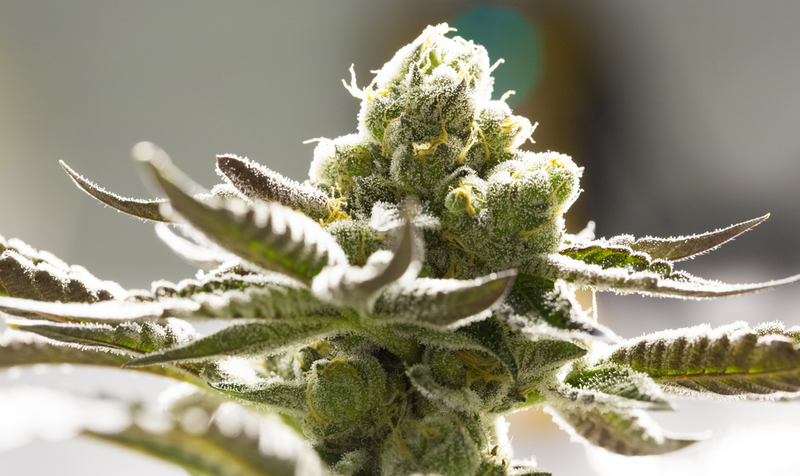 You’ll know when to harvest marijuana when at least 50 percent of the trichomes turn cloudy. Either of the above methods will work for determining when to harvest marijuana, but your best bet is to use a combination of both. Sometimes, the trichomes will start to turn cloudy but the pistils will still be white. And sometimes, the pistils will begin to curl but the trichomes will still be clear. It’s only when both the pistils and the trichomes start to change that the cannabis plant is ready for harvest. This latter percentage (of both pistils and trichomes) is also associated with an increase in the presence of CBN and heightened anti-anxiety effect. You can either cut the entire plant off at the stem or trim off individual branches. Either way will work. It might depend on how you decide to hang your bud, but don’t give this step too much thought. Just start cutting. Definitely trim the fan leaves off your pot plant. You may choose to trim any smaller leaves off the bud as well. That’s fine, but it won’t hurt the process if you leave them until later. In the end, getting rid of those smaller leaves gives you a smoother experience (too much leaf matter gives your bud a harsh quality). Plus, it just makes your buds look nice. There are many ways to hang bud to dry. Find one that works for you. The simplest method is to use a clothes rod and some hangers. Clip or tie your weed upside down on the hangers and store them on the clothes rod. 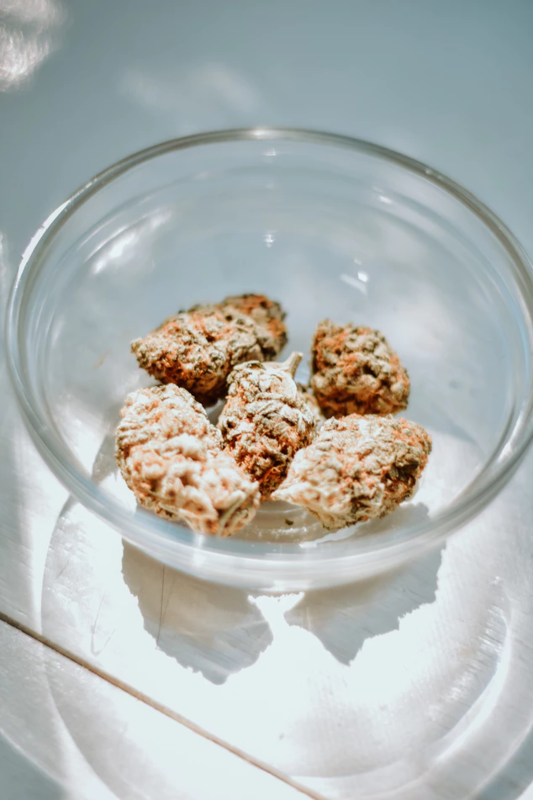 However you choose to dry your marijuana, you’ll need to keep the environment at 70 degrees Fahrenheit (21 degrees Celsius) and 50 percent humidity. This is where all the environmental controls we mentioned earlier come into play. 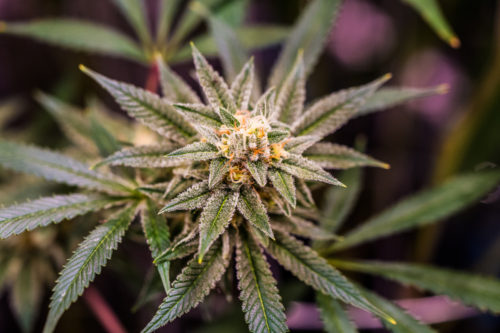 When your buds feel dry to the touch and smaller stems snap instead of bend (typically 3-7 days), remove the flowers from the stems. After you remove the buds from the stems, pack them loosely in a mason jar and screw on the lid. During the curing stage, store the jars in a dark room with the temperature at 70 degrees Fahrenheit and 60-65 percent humidity. The curing period usually lasts about three weeks. You should open the lid of the jar and let the bud breathe for the first 2 weeks of curing. You can also shake the jar gently (with the lid on) to prevent moisture from collecting in any one place (which can cause rot). Place the mason jars in a cool, dark room for long-term storage. A closet or cabinet works great. If you’re going to store your bud for six months or more, consider vacuum sealing or keeping the mason jars in the freezer. You did it! You successfully grew, harvested, and cured your own marijuana. You’re officially a pot farmer. Congratulations! Now it’s time to celebrate. 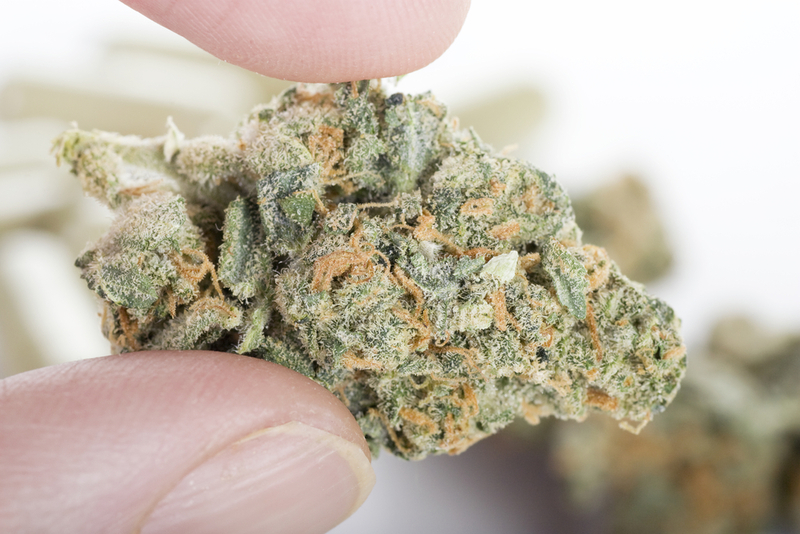 Pull one of the buds out of storage, grind it, roll a joint or blunt, and fire it up. Ahh, delicious. Homegrown weed does taste better, doesn’t it? Take a moment to enjoy the fruits of your labor. But don’t sit too long. Soon, it will be time to plant another batch of cannabis seeds and start again. The post How And When To Harvest Marijuana Plants | The Complete Guide appeared first on Honest Marijuana.